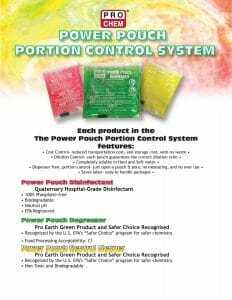 POWER POUCH NEUTRAL CLEANER | Pro Chem, Inc.
POWER POUCH NEUTRAL CLEANER is a mild concentrated neutral pH floor cleaner designed for mopping floors and for cleaning all washable surfaces. It contains no caustic, abrasive or any harsh ingredients that mar fine floor finishes. 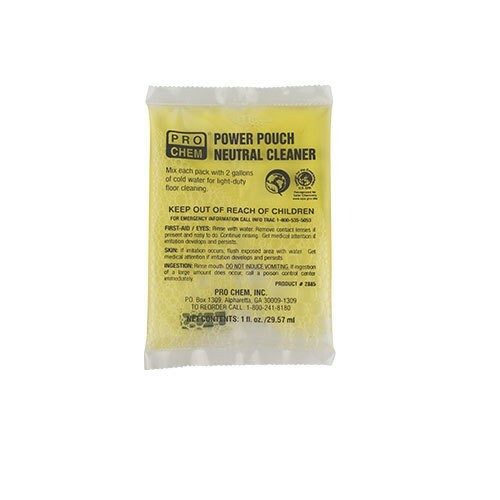 This product dissolves completely in cold water and works equally well in hard or soft water. It leaves floors sparkling clean without a film or streaks. 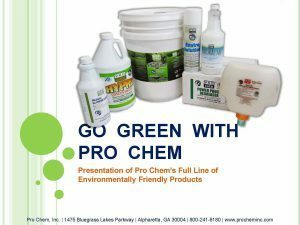 Packaged in source-reduced plastic packs, it is formulated to meet published standards of environmentally preferable industrial and institutional cleaners. These standards require low levels of human and aquatic toxicity, high levels of biodegradability and performance and reduced smog production potential. Mix each pack with 2 gallons of cold water for light-duty floor cleaning.